1 Find A Grave, (accessed 08/29/2014). 2 The Rhode Island Historical Magazine (Formerly the Newport Historical Magazine), 1885, Vol. 5, No. 4, p. 322, Google Books (Digital Library). 3 Davenport, Charles Benedict, Naval Officers: Their Heredity and Development, Washington, D.C.: The Carnegie Institution of Washington (1919), 168, Google Books (Digital Library). 4 Roberts, Gary Boyd, comp., Ancestors of American Presidents , Boston: New England Historic Genealogical Society (2009), 615. 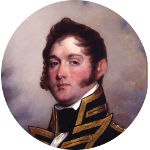 5 Wikipedia, "Oliver Hazard Perry", (accessed 08/29/2014).